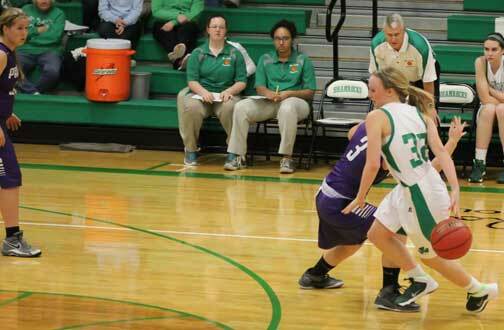 Kayla Meyer has been a rebounding machine as she leads the team on the year with six boards a game. Mokane, Mo. 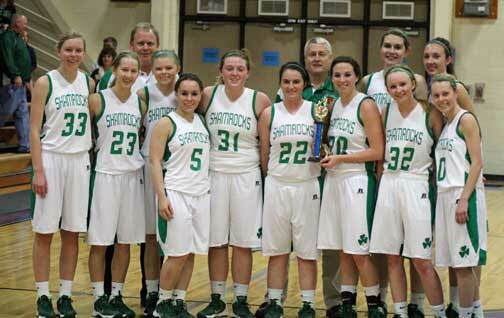 - Kayla Meyer and Megan Shockley played key roles in New Haven’s 40-27 win over Russellville in Saturday’s third place game of the South Callaway tournament. Shockley came off the bench in the second period, scoring eight of her nine points to give the Lady Shamrocks a 16 point halftime lead. Meyer was one rebound shy of grabbing her second double-double in the tournament, finishing with nine rebounds,10 points, and a perfect 4-4 from the charity strip. In New Haven’s first possession Rachel Steinhoff drove baseline for an easy two points then swished a 15-footer before Meyer scored off an offensive rebound forcing a Russellville timeout as New Haven quickly jumped out to a 6-0 lead. 4th quarter - After scoring just three points in the 3rd quarter New Haven continued to struggle offensively but held Russellville scoreless until the 1:15 mark where they hit one of two free-throws before New Haven was finally able to attack the Lady Indians press. 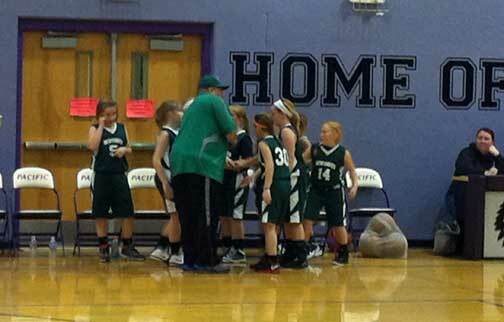 Pictured left is the 5th grade girls team. Union, Mo. 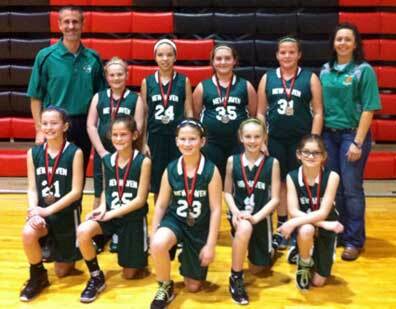 - Last weekend New Haven’s 4th and 5th grade girls teams were in action at the Union Tournament where the 4th graders finished second and the 5th graders walked away with consolation. Stephanie Gerling is nails from the left corner. Mokane, Mo. - Tuesday night New Haven was flat out on fire, shooting 81% from the field in the first half, putting up 34 points while holding New Bloomfield to just 13. 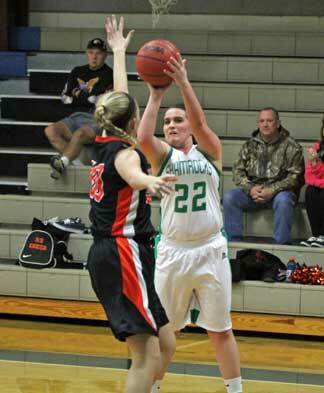 Stephanie Gerling’s eight first quarter points, hitting her first four shots, ignited New Haven to a 54-32 win, setting the stage for Thursday night’s early season showdown with number one seeded and undefeated Hermann Lady Bearcats. 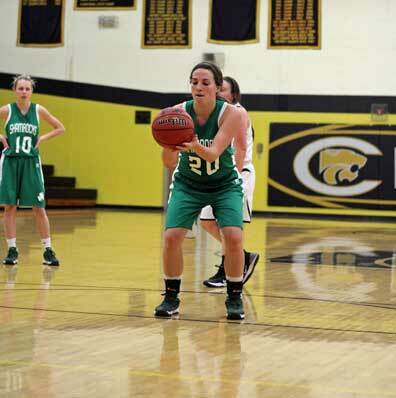 Emily Kallmeyer was nails down the stretch hitting 5 of 6 free throws in the final 40 seconds. New Haven, Mo. - In Thursday night’s game at Cuba it was obvious New Haven had not played in three weeks thanks to winter storms that forced their first two games to be cancelled following the Christmas break. “You could really tell that we had not played in 21 days. We were not sharp on offense, to many tipped passes, and slow in defense. 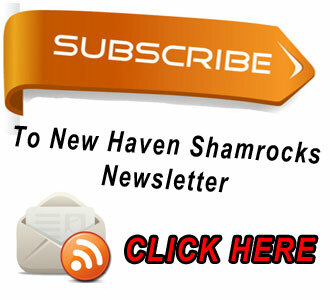 It didn’t that we missed several practices during the layoff either”, said Coach Doug Peirick. 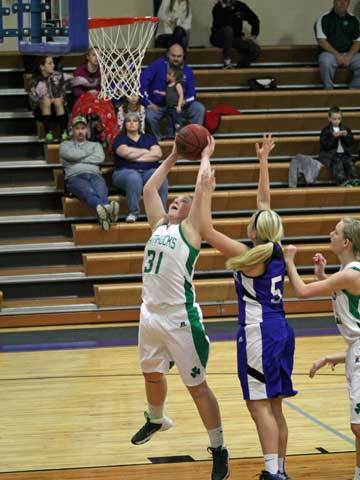 New Haven got off to a slow start as Cuba jumped out to an 8-3 lead, before Kayla Meyer scored a layup at 3:32 mark. While New Haven held Cuba scoreless during the rest of the first quarter, Stephanie Scheer hit a 17-footer, making it a one point game, 8-7. Spring Bluff, Mo. 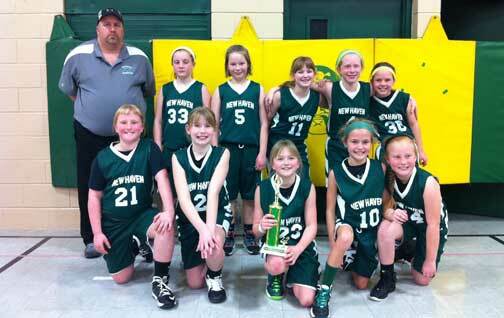 - New Haven’s 4th grade girls basketball team nearly pulled off a dramatic comeback in Saturday’s championship game at the Spring Bluff Tournament. In the double elimination five team tournament New Haven easily won their opening round game on Thursday, holding Union scoreless to pickup their fourth straight win 24-0. Thursday, Jan. 2 - Tonight's New Haven freshmen and girls basketball games against Bourbon have been cancelled due to weather conditions. A rescheduled date has not been set at this time. This past weekend the New Haven 4th grade girls basketball team lit it up in The Pacific Shootout, out scoring their opponents 107-7. Their first game on Saturday they beat Washington 32-7 and the only team that would score against New Haven the rest of the weekend.